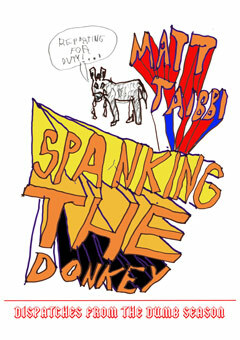 Spanking the Donkey is a campaign diary like no other. Celebrated reporter Matt Taibbi turns a withering eye on the kissing contest of puffed-up martinets and egomaniacal fantasists more generally known as the 2004 Democratic primaries. Taibbi’s contempt for the whole charade, and for most of those involved (including a generous helping of his fellow journalists), makes for a searing and highly entertaining account. His refusal to take the proceedings seriously leads him to volunteer for Wesley Clark’s New Hampshire campaign in the guise of an adult-film director, while his take on a John Edwards press conference in New York City is filtered through the haze of hallucinogenic drugs. Taking up residence in slums and halfway houses as he follows the circus around the country, Taibbi juxtaposes an idiotic dog-and-pony show in which clashes of plainly identical candidates are presented as real controversies, with the quite separate concerns of the ordinary Americans whose lodgings he shares. The gap between the antiseptic exercise in faint patriotic optimism that is mainstream politics and the harsh realities of life for the millions of Americans that the electoral parade simply passes by has never been more sharply, or hilariously, sketched.